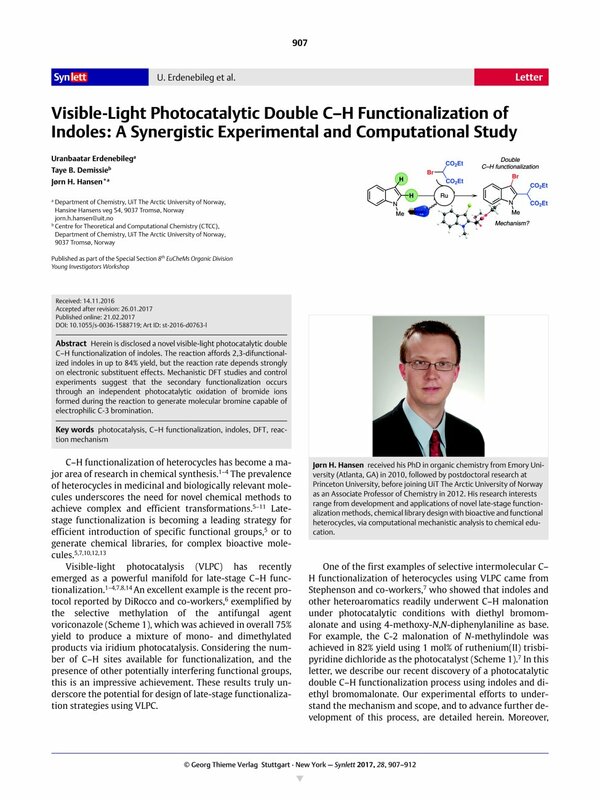 Herein is disclosed a novel visible-light photocatalytic double C–H functionalization of indoles. The reaction affords 2,3-difunctionalized indoles in up to 84% yield, but the reaction rate depends strongly on electronic substituent effects. Mechanistic DFT studies and control experiments suggest that the secondary functionalization occurs through an independent photocatalytic oxidation of bromide ions formed during the reaction to generate molecular bromine capable of electrophilic C-3 bromination. Supporting information for this article is available online at http://dx.doi.org/10.1055/s-0036-1588719. Detailed experimental procedures, characterization and spectra, as well as computational details and xyz-coordinates, are included. 15 General Procedure An oven-dried 10 mL round-bottom flask was equipped with a rubber septum and magnetic stirrer and was charged with the heteroaromatic substrate (0.5 mmol, 1.0 equiv), tris(2,2′-bipyridyl)ruthenium(II) chloride hexahydrate (5.0 μmol, 3.70 mg, 1.0 mol%), 4-methoxyphenyl-N,N-diphenylamine (1.0 mmol, 0.274 g, 2.0 equiv), diethyl bromomalonate (1.0 mmol, 0.239 g, 2.0 equiv), and DMF (2.0 mL). The mixture was degassed by the freeze-pump-thaw method, and the reaction vessel was filled with argon. A 1 W blue light-emitting diode (LED) strip was placed around the reaction vessel at a distance of approximately 2–4 cm. The reaction was stopped by removing the LED lamps, and the mixture was poured into a separatory funnel containing EtOAc (10 mL) and water (10 mL). The layers were separated, and the aqueous layer was extracted with EtOAc (2 × 10 mL). The combined organic phases were washed with brine (10 mL), dried (anhydrous Na2SO4), filtered, and concentrated on a rotary evaporator. The residue was purified by preparative HPLC on a C18 column, using water and MeCN eluent systems. Appropriate fractions were collected, frozen and lyophilized to afford the products as pure compounds. Analytical Data for Compound 2 IR (neat): 3063 (w), 2981 (m) 2937 (m), 1736 (s), 1613 (w), 1467 (s), 1392 (m), 1367 (s), 1344 (m), 1308 (s), 1266 (s), 1240 (s), 1210 (s), 1175 (s), 1150 (s), 1108 (m), 1095 (m), 1031 (s), 946 (m), 853 (w), 739 (s) cm–1. 1H NMR (400 MHz, CDCl3): δ = 7.55 (d, J = 7.8 Hz, 1 H), 7.34–7.28 (m, 2 H), 7.22–7.18 (m, 1 H), 5.35 (s, 1 H), 4.33–4.21 (m, 4 H), 3.81 (s, 3 H), 1.30 (t, J = 6.9 Hz, 6 H). 13C NMR (100 MHz, CDCl3): δ = 166.7 (2 CO), 137.3, 128.5, 126.3, 123.3, 120.5, 119.5, 109.7, 93.6, 62.4 (2 CH2), 50.3, 32.0, 14.1 (2 CH3). HRMS: m/z calcd for C16H19O4NBr+ [M + H]+: 368.0492; found: 368.0491.